Completed in September 2006, UNCW's Cultural Arts Building is a 104,830 square foot academic and performance facility, housing three of the university's arts-oriented academic disciplines--Art & Art History, Music and Theatre---in a technologically-advanced environment of the highest performance capability and learning potential. 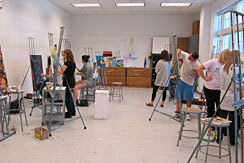 The Cultural Arts Building includes smart classrooms, lecture halls, a shared computer classroom with discipline-specific equipment, graphic design and printmaking studios, student rehearsal rooms, recording studios, archive rooms, costume and scene shops, and state-of-the-art performance and exhibition spaces. The Art Gallery in the Cultural Arts Bulding is the primary exhibit hall for the Department of Art and Art History. 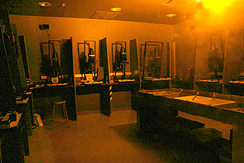 The 700 square foot gallery houses many of the department's student and faculty exhibitions as well as guest exhibits from throughout the country. Art Gallery hours vary depending on the exhibit. 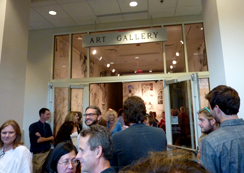 Receptions are typically held on the opening night of each show between 6-8. All events are free and open to the public. Click here for information. All three studio have Northern light and adjustable ceiling lighting. • Screen washout unit, back lit, 42" x 58"
• Levigator, 10" x 1 ½ "
• Variable temperature hotplate, 24" x 36 "